You generally know what you're going to get when it comes to the Miracle Man, a villain through and through whose powers can make any of his wishes or desires into reality. He and Graviton are much alike, in that both men feel a sense of entitlement as to what the world owes them and the deference that should be given them--and both have demonstrated that their mania can lead to overreach, and subsequent defeat. But while Graviton restricts his focus to real-world concerns in his quest to rule, the Miracle Man often strays into fantasy scenarios that lend themselves to the stuff that dreams are made of. When he returned to battle the Fantastic Four, he created a dazzling city in the middle of the Oklahoma desert, complete with a population and, of course, a bride (another inclination he shares with Graviton); and later, when the Ghost Rider and the Thing encountered him at the Konohoti Indian reservation, he'd recreated the tale of the Three Wise Men, fashioning himself as no less than "the Creator" and overseeing the birth of the Messiah in order to be validated as having achieved godhood. 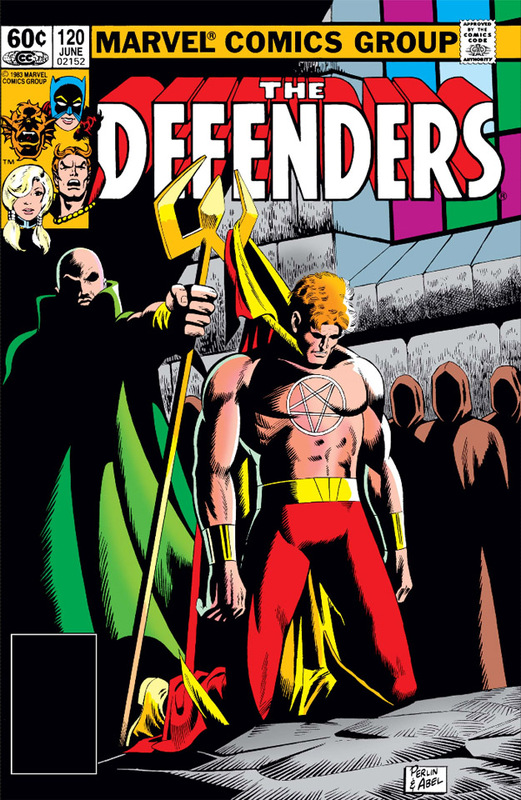 Yet when the Miracle Man returns in a mid-1983 Defenders story, we discover that he's taken a more subtle path to godhood, though, as we'll discover, no less ambitious. Also, at the Massachusetts monastery where this tale begins, we encounter a more conspicuous character who surely represents the opposite end of that spectrum, who's come seeking the peace and forgiveness that this edifice offers--Daimon Hellstrom, the Son of Satan, who has sought the counsel of an old friend from his seminary, Father Gosset, in the hope of bringing some sense of balance and order to his dual (and, he fears, damned) nature. But there is another he'll meet who could either turn out to be a kindred spirit--or someone equally at a loss to suppress who he really is. It's after Daimon has begun orienting himself to the rituals and routine of the monastery that he encounters Brother Joshua, who came to this place months ago as an amnesiac and decided to stay and pursue a life as a monk. 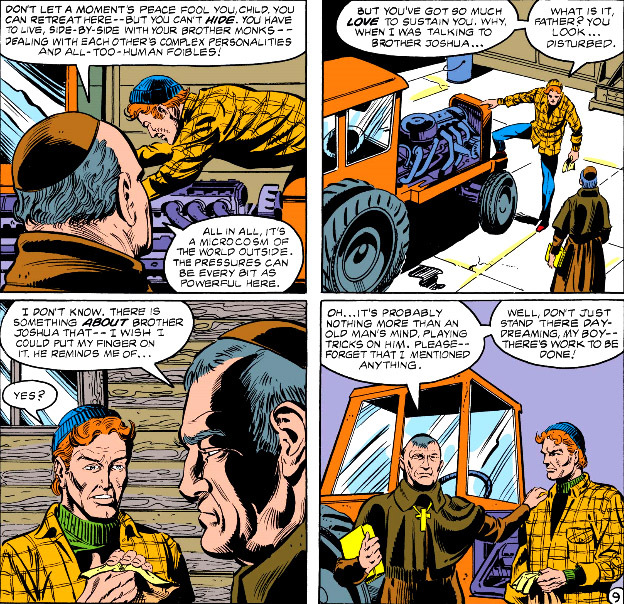 The two men hit it off almost immediately, with Daimon seeing through Joshua the peace and spiritual succor that the monastery offers to one as conflicted as himself; but Father Gosset appears to have concerns about the paths of both of these men. 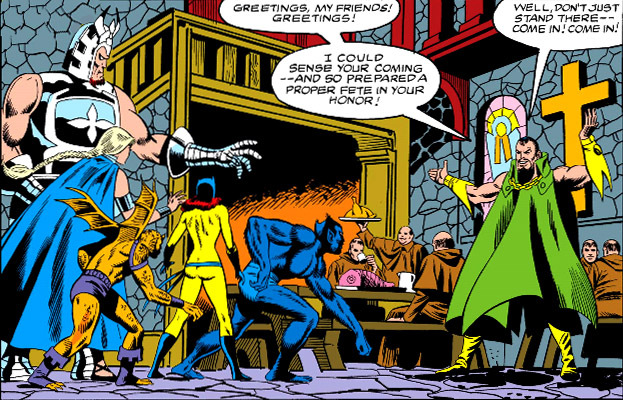 Meanwhile, Patsy Walker, a/k/a the Hellcat, has notified the Defenders of a strange dream she's been preoccupied with, one that has convinced her that Hellstrom is in trouble. And she may well be right, as he has begun experiencing unexplained bouts of shortness of breath combined with sharp pains within his heart. 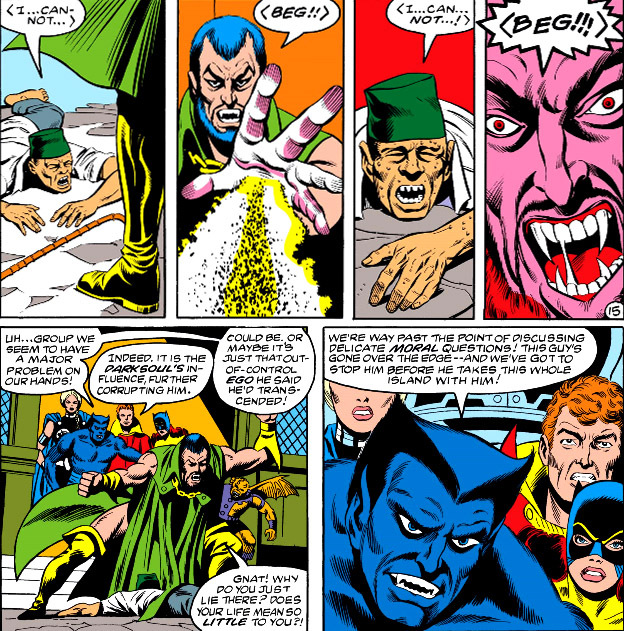 Following one such episode, he's led by a mysterious light to where Brother Joshua is meditating--and what he finds raises more questions about this man, though Hellstrom can't help but sympathize with what appears to be one more thing they have in common. The next morning, Hellstrom indeed keeps his silence as Joshua begins the formal process of taking his final vows. But two developments mar what would normally have been an occasion of joy for all present: as Hellstrom has another agonizing episode of chest pain, Joshua comes to realize that his life encompasses a destiny far different from the expectations of his fellow monks. With the exception of the Miracle Man, it's become a day of horror for all involved. 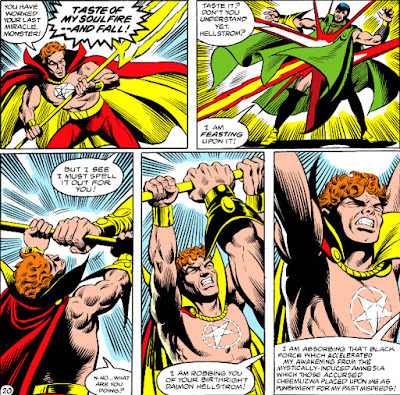 Hellstrom, transforming to his costumed darker self, at first tries to reach Joshua with words by emphasizing that they're two of a kind, and, as such, Hellstrom can relate to what he believes Joshua is going through. 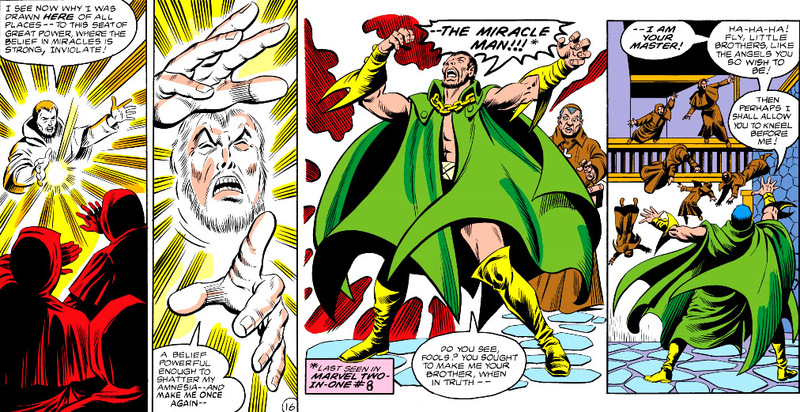 But presumably knowing nothing of the Miracle Man's past, Hellstrom may have misread this man as simply waging a fight of good vs. evil--while the Miracle Man has no problem with educating Hellstrom in his utter ruthlessness by reducing the assembled monks to figures of dust. It's then that Hellstrom explodes into rage and strikes back. 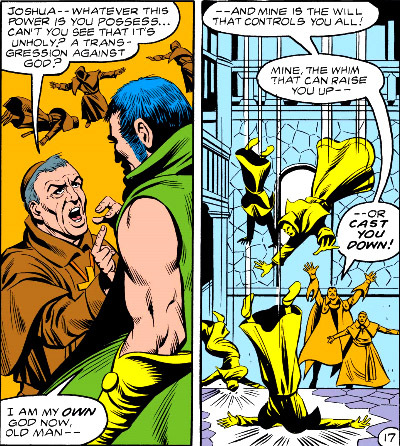 Unfortunately, he'll discover that the Miracle Man has become fixated on stealing the source of that rage--a source that both of them will eventually come to realize is playing its own game. With the Defenders finally managing to locate Hellstrom's whereabouts, they arrive to face a harsh reception by the Miracle Man before entering the monastery and confronting him directly. But they're confused to see that the Miracle Man's demeanor, compared to his arrogant and abusive actions thus far, has curiously now become the difference between night and day--though they only have to look closely at the monastery's hapless residents to convince themselves not to lower their guard. 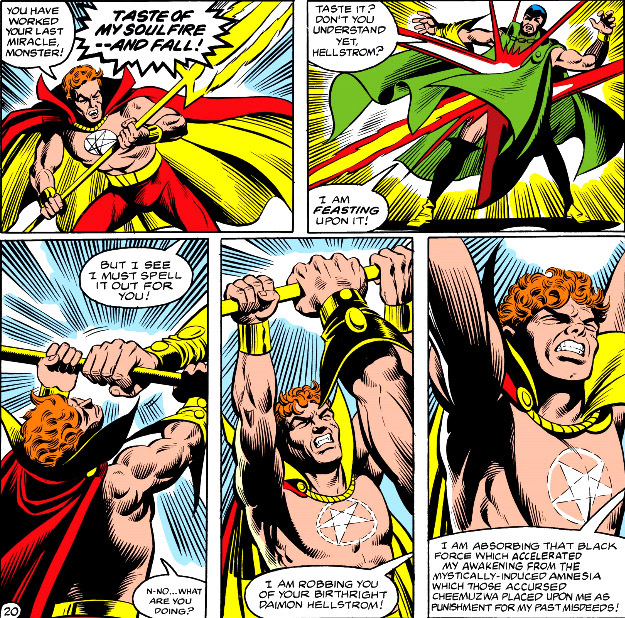 It's an impressive claim the Miracle Man makes, if true--having the ability to completely control and conscript this satanic force that often made Hellstrom a danger to others. To lend proof to his claims of not only mastering the Darksoul but also of turning over a new leaf, as well as his intention to liberate the Earth and its people from the hardships of war, poverty, and the like, the Miracle Man transports himself and the Defenders to Indonesia, so that they may witness a demonstration of sorts of what he will do for the entire world. Instantly transforming a collection of impoverished villages into nothing short of a paradise, the Miracle Man has certainly given the populace cause to believe in a "promised land" which they've seen appear before their eyes--while the Defenders note the new sights as well as the sounds of happiness with a mixture of gratitude and concern. As of yet, that concern is restricted to the possibly detrimental effects of a sudden shift in good fortune for the villagers, rather than for the one who created this "miracle"--but that will change in due course. Even for the Miracle Man, who's often demonstrated a tendency toward being quick to anger, this sudden shift in temperament from annoyance and impatience to sheer rage is shocking--and it's not exactly rocket science to be able to identify the influence of the Darksoul, which doesn't appear to be as suppressed or harnessed as the self-assured Miracle Man had believed. It's not really clear from J.M. 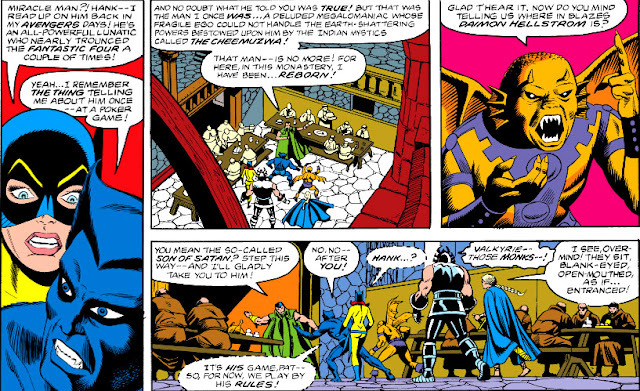 DeMatteis' story* why the Miracle Man felt it necessary to take and retain the Darksoul as his own, given that his power hardly needs augmenting. 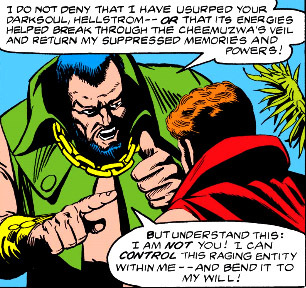 We know that the Darksoul enabled the Miracle Man to defeat the actions of the Cheemuzwa in suppressing his memories; but since he'd regained his memories before he thought to take possession of it, we can only presume that he believes it offers continued protection against their efforts to contain him. *We'll have to include artist Don Perlin on this point, as well, since he's listed as co-plotter. 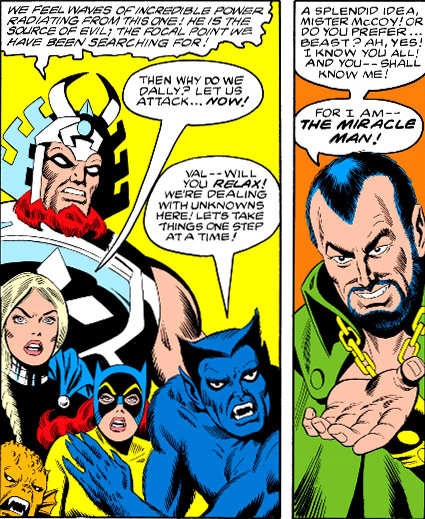 At any rate, the Defenders' efforts to bring down the Miracle Man meet with defeat--but their resistance has stirred the true protagonist in this conflict, which has used the Miracle Man for its own ends and which now moves to act to ensure its continued ascendance. Yet before the Darksoul can reach its target, a hastily concocted plan by Hellcat, together with the help of the Over-Mind, is able to redirect the transfer to another host--leaving the Miracle Man repentant (if not innocent) as Brother Joshua once more, while the "miracles" unleashed this day cease to exist. 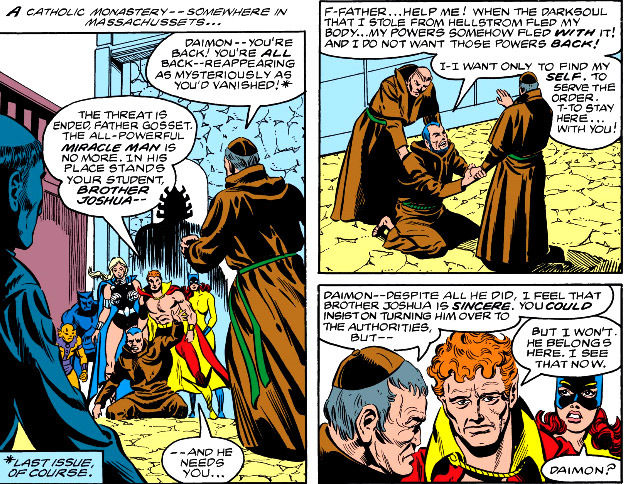 And interestingly enough, it's Hellstrom who has faith enough to leave him be. 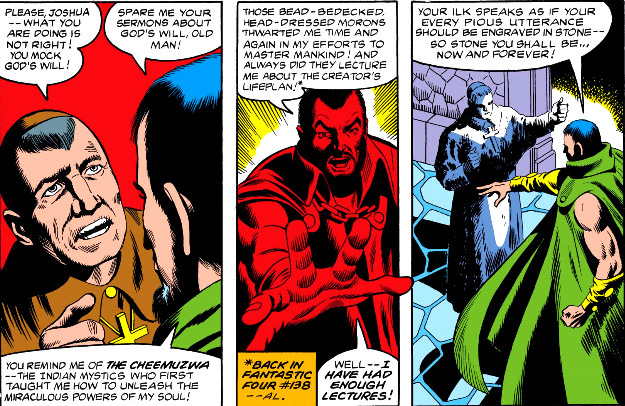 The ending opens the door to quite a development: Daimon Hellstrom, now able for the first time to face the prospect of a happy life with the one he loves, free of the burden of the thing within him that corrupted his soul and to a great extent influenced his thoughts and actions. How he resolves that new aspect to his life with the heritage he presumably still must call his own is a story yet to come. Somebody should have been writing it all down. Made a file or something. Your Guided Tour of The Time Variance Authority! A Touch Closer To... Death! "Beyond The Border Lurks Death!" In The Clutches Of Doom! I Stand With The Thunderbolts!